(CNN) – Secretary of State Hillary Clinton sounded a confident note on her boss' reelection prospects in Tunisia Saturday, telling a group of Arab students President Barack Obama would be president for another four years. "He will be re-elected president," Clinton said in Tunis. "I think that will be a very clear signal to the entire world as to what our values are and what our president believes." Clinton was responding to a question from a Tunisian student named Ivan, who asked about the staunch pro-Israel stance nearly every American politician, both Republican and Democrat, espouse when they're running for office. Clinton, a former presidential candidate herself, said campaign trail stumping often gains outsize significance that doesn't actualize when governing. "You will learn as your democracy develops that a lot of things are said in political campaigns that should not bear a lot of attention," Clinton said. "There are comments made that certainly don't reflect the United States, don't reflect our foreign policy, Don't reflect who we are as a people. If you go to the United States you see mosques everywhere, you see Muslim Americans everywhere. That's the fact. So I would no pay attention to the rhetoric." Republican candidates running for their party's presidential nomination often accuse Obama of appearing weak in his support for Israel. Former Massachusetts Gov. Mitt Romney said at CNN's Florida Republican Presidential Debate in January that Obama "threw Israel under the bus with regards to defining the '67 borders as a starting point of negotiations." Romney added, "I think he has time and time again shown distance from Israel, and that has created, in my view, a greater sense of aggression on the part of the Palestinians. I will stand with our friend, Israel." Fellow candidate Newt Gingrich, the former House speaker, said at the same debate "we're in a continuous state of war where Obama undermines the Israelis." Clinton said political observers from abroad should take cues about American policy from Obama, not from the presidential candidates. "I would say watch what president Obama says and does. He's our president. He represents all of the United States," she said, adding she found it surprising people in Tunisia and other countries "pay more attention to what is said in our political campaigns than most Americans." 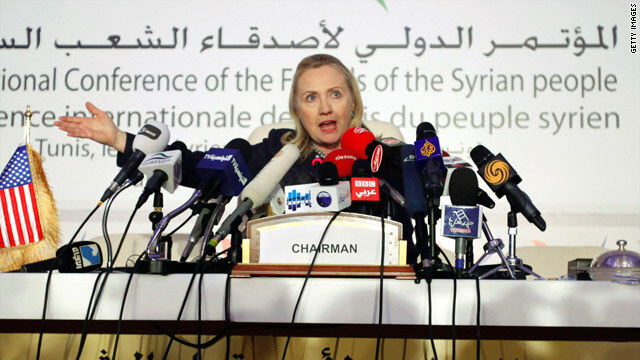 Clinton was in Tunisia meeting with other world leaders who oppose Syrian President Bashar al-Assad. CNN Foreign Affairs Reporter Elise Labott contributed to this report. Sarah Palin is superior over Hillary Clinton in every single way. @bob springer: "It is very very clear that his views and policies in general do not represent even half of the American public." According to Rasmussen (a conservative-leaning polling organization), President Obama picks up 87% of the Democratic vote; given that there are more registered Democrats than Republicans, I would say that number puts his policies well above half when it comes to representing what Americans want. Besides, what's not to like about 23 straight months of private sector job growth? Or GM alive and bin Laden dead? Or health care reform that doesn't allow your insurance company to drop you if you get sick or you give birth to a special-needs child? Or investment in OUR country and her people and infrastructure? Or asking wealthier Americans to pay their fair share (which 68% of American millionaires and billionaires say they WANT to do)? President Obama's policies, which kept us from going into a Great Depression, are turning our economy around and moving us forward may not be what YOU want, but a majority of Americans DO WANT this.